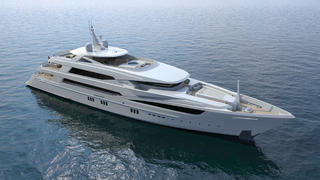 UAE boatbuilder Gulf Craft has announced plans to build its largest yacht to date, the Majesty 200. At a press conference today (September 28) at the Monaco Yacht Show, the Majesty 200 was described by the yard as its first megayacht (defined as yachts over 50 metres). Featuring opulent interiors and extensive lounging spaces, the 63 metre tri-deck yacht will be built using the latest engineering technology, Gulf Craft added. Key features on board the Majesty 200 will include a retractable helipad, sun deck spa pool and a superyacht beach club, although the total number of cabins and the exact engine installation is yet to be confirmed. Other projects currently under development at Gulf Craft include the Majesty 175, a composite superyacht measuring 53 metres LOA, which was also announced this week at the Monaco Yacht Show.